One of the last films of stop-motion animator Ray Harryhausen's movies to "go Blu," The 3 Worlds of Gulliver (1960) isn't a favorite among fans, who much prefer the fantasy extravaganzas of The 7th Voyage of Sinbad (1958) and Jason and the Argonauts (1963), or even some of his earlier, less expensive monster outings of the 1950s (Earth vs. the Flying Saucers, The Beast from 20,000 Fathoms, etc.). The 3 Worlds of Gulliver limits itself to just two short stop-motion set pieces. The bulk of the film incorporates extensive traveling mattes of varying quality, relying more on its very ‘50s take on Jonathan Swift's 1726 satirical novel. Like many viewers, one suspects, I enjoyed it a lot more as a child than as an adult when its basic flaws are more apparent. It is, however, a fascinating work from a production standpoint. After humble beginnings making low-budget exploitation films for Columbia Pictures via "Jungle" Sam Katzman's Clover Productions, Harryhausen and his longtime producing partner, Charles H. Schneer, struck out on their own, scoring a huge success with The 7th Voyage of Sinbad, economically shot on location in Spain and in color. Expertly hyped, this B-budgeted movie was marketed and distributed like a "nervous ‘A'" and apparently made an enormous amount of money for Columbia. They followed Sinbad with The 3 Worlds of Gulliver. Clearly Schneer and, to a lesser extent, Harryhausen were reaching for a wider, more mainstream audience compared to the limited youth market of their earlier Columbia features. Though in the same general range as Sinbad budget-wise, the supporting cast is a little more prestigious and, most uncharacteristic for Harryhausen, the movie even boasts two songs (by Ned Washington and George Duning). In Wapping, England at the end of the 17th century, Dr. Lemuel Gulliver (Kerwin Mathews) is obsessed with providing a more financially secure future for his fiancée, Elizabeth (June Thorburn), who'd happily accept living with her man in the dilapidated cottage they almost purchase. Instead, Gulliver goes to sea aboard a merchant ship Elizabeth has also stowed away on. Their reunion is short-lived, however, as Gulliver is washed overboard during a storm. He awakens on the shores of Lilliput, a prisoner and later a citizen of the tiny human beings that occupy it. At first Gulliver dreams of using his extreme relative height to turn Lilliput into a paradise, but Lilliput's tyrannical emperor (Basil Sydney) insists on using Gulliver as a secret weapon in their war with Blefuscu (a war that began over opposing views on how to properly crack open an egg). A disenchanted Gulliver sails away and eventually lands on Brobdingnag, where now Gulliver, reunited with Elizabeth, becomes the pet of a royal court of giants. The Harryhausen-Schneer collaborations were nearly all void of political content*, making the overtly political Gulliver's Travels a strange choice of novel to adapt. Only Nigel Keale's screenplay for The First Men ‘in' the Moon (1964) offers a similar vein of gentle political ribbing, but where Kneale's script was witty and understated, Arthur A. Ross's screenplay for Gulliver is painfully simplistic: War is senseless. Oppression is bad, etc. Mathews, it turns out, even sings well, a not-bad solo piece called "Gentle Love." Contrastingly, the picture's other tune, "What a Wonderful, Wonderful, Wonderful Fellow is Gulliver" rivals "Hooray for Santa Claus" from Santa Claus Conquers the Martians on the inanity charts. Harryhausen's signature stop-motion is limited to scenes of Gulliver being menaced by, of all silly things, a giant squirrel (The Great Rupert's Revenge?) and an excellent if all-too-brief battle between Gulliver and a stop-motion crocodile. Instead, the special effects master concentrated his energies on travelling mattes for Gulliver's integration with the Lilliputians and Brobdingnagians, using the sodium process then exclusive to Great Britain's film industry. (Disney and Japan's Toho Studios would soon acquire it, however.) This process work alternates between effective and dodgy, though Harryhausen's choice of angles and integration of miniatures, etc., is effective. Also returning from Sinbad is the great film composer Bernard Herrmann, whose music is whimsical for the Lilliput scenes (sounding a bit like his score for The Devil and Daniel Webster and parts of The Magnificent Ambersons) before turning more effectively ominous for the scenes on Brobdingnag. 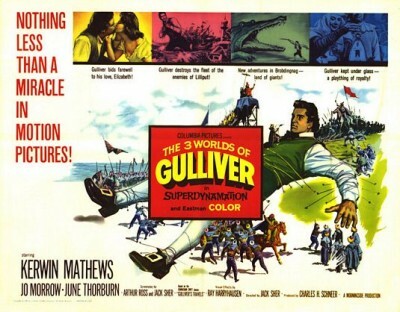 Offered in both 1.66:1 and 1.78:1 widescreen (I prefer the former, which has better framing**), Twilight Time's region-free disc of The 3 Worlds of Gulliver is a fine 1080p encoding, about on par with The Mysterious Island (1961), the next Haryhausen-Schneer film. Little details not noticeable before, like the painted background buildings in opening Wapping scene. The 2.0 DTS-HD Master Audio (mono) is likewise good. Most of the extras have been recycled from the DVD, but new to home video is an excellent audio commentary track featuring film historians C. Courtney Joyner, Randall William Cook and (for the music) Steven C. Smith. An isolated score track and Julie Kirgo-penned liner notes are also included. Though lesser Harryhausen The 3 Worlds of Gulliver is still fun for kids as well as adults willing to overlook the screenplay's shortcomings. Recommended. * And probably a good thing, too. Harryhausen's personal politics were by all accounts somewhere to the right of the Tea Party, the animator once insisting to a colleague that the Los Angeles riots of 1992 had been instigated by the "Red Chinese." ** Sony's earlier DVD had been full-screen, though the same company's DVD in Japan was 16:9 enhanced widescreen.